Tokyo Gekijo (Theater), Tsukiji, c. 1930. 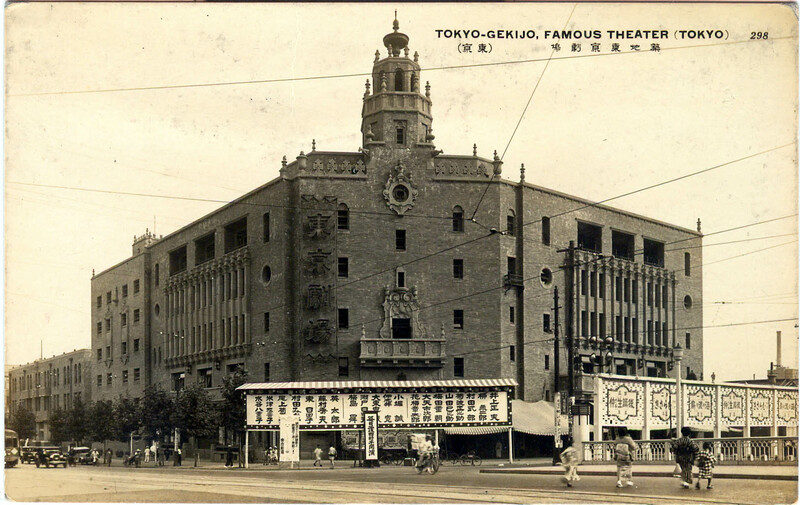 Tokyo Geikijo (Theater), Tsukiji, c. 1930. Tokyo Gekijo opened in 1930, a modern 1900-seat venue suitable for viewing Kabuki, Western operas and motion pictures. “Kabuki made a rapid return to the stage after the war, although there were scarcely any suitable theatres in which to perform it. 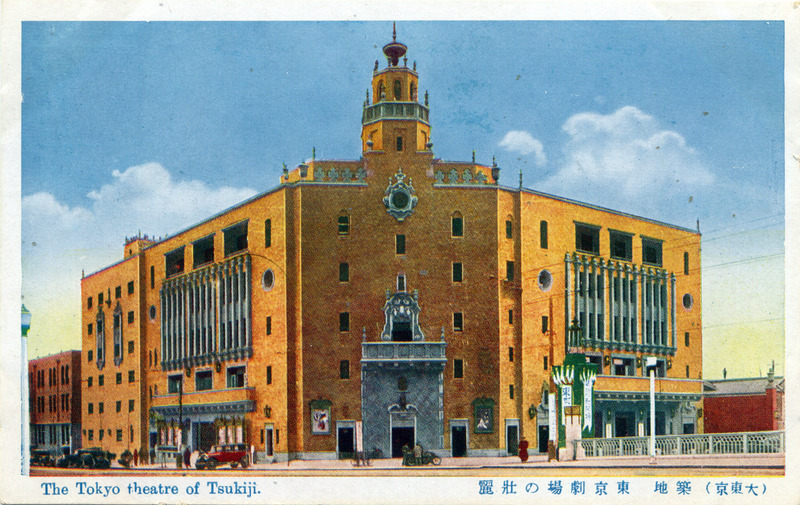 While the Toho Corporation’s Tokyo theatres, such as the Teikoku Gekijo (Imperial Theatre), the Yuraku-za, and the Nichigeki emerged virtually unscarred, Shochiku, which control most of kabuki, had lost all but one of its theatres, including the Kabuki-za. That one remaining was the Tokyo Gekijo (popularly called the Togeki), a large playhouse seating nearly 1,900 and built in 1930 in the Tsukiji section, about two blocks from the Kabuki-za. This well-equipped venue had all of the appropriate kabuki architectural components, including a revolving stage and audience runway (hanamichi). On September 1, 1945, only two weeks after the surrender (and a day before the signing of surrender documents), the Togeki presented Ichikawa Ennosuke II and his company in Kurozuka and Tokaidochu Hizakurige. Tokyo Gekijo, c. 1940. The building remained the sole-standing Kabuki theater in Tokyo after the devastating firebombings of the city in March, April and May, 1945. It was on its stage that Kabuki made its return during earliest days of the Occupation.